I love cats, especially my own three boys, and will read any book that attempts to make sense of their behavior. As any cat owner knows, making sense of our furry companions sometimes seems impossible, but Bradshaw does a pretty good job. He is a scientist of some kind, so his observations deal with two main aspects of cats: genetics, and observable behavior. However he does a good job of expressing complicated science in readily accessible language. It also becomes apparent that, science aside, Bradshaw is someone who has had close and loving relationships with cats. After all, its not every day you read a book in which a scientist moves from discussion of domininant genes expressed in coat coloration to the personalities of individual cats. There were two sections I found most interesting in Cat Sense. For starters, the history of the cat pre-Egypt (Egyptian cat worship being possibly one of cats’ more famous roles.) Although there are species of wild cats all over the world, domestic cats every where are in fact descended from one particular race of cats which originated in north Africa and the Middle East. As we all know, as humans moved from hunter/gatherers to agricultural societies, cats were attracted to higher concentrations of rodents that fed on human grain stores. At some point, people recognized that cats were useful not only for pest control but also for companionship, entertainment and possibly warm fert on cold nights. But this was not a simultaneous discovery around the world- rather, cats were domesticated in one place over a period of time, and then those tame cats were carried by trading ships around the world. The second most interesting section addressed cat communication, including purring, grooming and especially meowing. Adult feral cats (domestic species living in the wild) rarely meow; its a behavior primarily used between mother cats and kittens. Yet it was familiar enough to Egyptians that their word for cat was “miw” (which oddly became a popular girls name too) and still today, Chinese people call cats “mao-mi.” Bradshaw suggests that cats do not use meows to communicate so much as to secure the attention of humans, and then to communicate by their actions and body language. 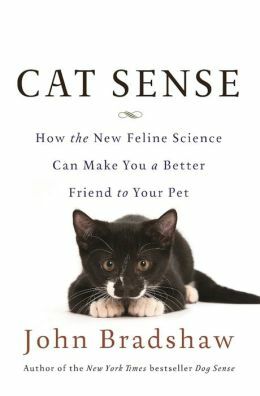 Cat Sense is geared towards cat owners (who else is going to buy it?!) and so includes many useful insights for understanding your pets and keeping them happy. Bradshaw points out that we have bred dogs over the centuries for various skills (hunting, herding, guarding, etc) but not so much with cats. All humans have ever really asked of cats is that they display their natural hunting behaviors, and keep us company. That is, perhaps, why cats always seem so much like wild-albeit tiny- animals in our homes: because they really are. Cat Sense does its best to make sense- in a loving, scientific way- of these pets. You might like: Feline Mystique, Clea Simon. Homers Odyssey, Gwen Cooper. This entry was posted in Non-Fiction and tagged book review, cats, Egypt, non-fiction. Bookmark the permalink.